The Federal Government is mandating new energy efficiency standards for water heaters as part of the National Appliance and Energy Conservation Act (NAECA). The update affects all water heaters manufactured in the U.S. sold after this month. Heaters will be 3 to 30% more efficient, compared to current models. The change will affect nearly all residential water heaters including electric, oil, gas and tankless gas heaters. The mandate specifically targets heaters with capacities from 50 or more gallons. In order to receive these savings on energy, your current water heater will need replacing. 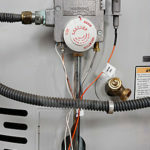 The consumer is not required to change their existing water heater but will have to meet the new requirement if and when they change it out in the future. These changes have an impact on how water heaters are designed, manufactured, tested, distributed and installed. All manufacturers are expected to provide heaters whose energy ratings match an energy percentage saved. In the past, this has been done by substituting fiberglass insulation to foam insulation. . One likely impact will be an increase in the overall product size, especially in diameter. Heaters will likely require additional insulation and/or completely new combustion systems. To maintain certain specifications such as size to meet dimension limitations in condos and apartment buildings, the manufacturers have decided to decrease the volume of water in the tanks to keep the same size tank. This means the cost of the smaller water heaters will increase dramatically, reducing equally in water capacity. Larger water heaters will require a heat pump system to be installed on top of the heater, increasing the cost of the heater by at least three times. On top of the installation fees, some areas will require permits and inspections, further adding to the cost of the water heater. The permitting includes an electrical detail that ensures new codes are being met, requiring an electrician on site. Extra permits mean additional costs. Haynes Plumbing is fully staffed, trained, and prepared to help you make this transition to the new 2015 standards. The mandate goes into effect on April 16th. Let us help you save on costs by replacing your water heater today. Give us a call at 828.254.6141 or visit us online here.